The overview of the SEI-CASE 2015 survey will be presented in webinars in collaboration with the National Institute of Steel Detailers (NISD). The first session will introduce the survey topics and trends from the last 8 years of the SEI-CASE survey. Links to register for Structures from Design to Construction will be posted. This session has already passed. 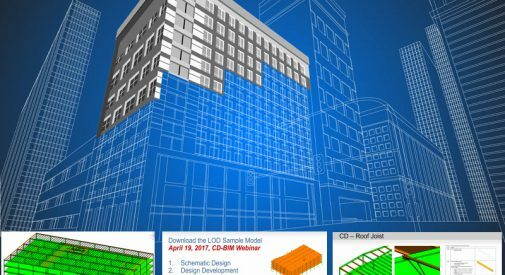 This webinar series is developed in collaboration with the National Institute of Steel Detailers (NISD), Structural Engineering Institutes (SEI) BIM Committee and the BIMForum. This webinar will review key topics related to risk, project success, and profitability with a focus on focus on key trends in the profession from design to construction of structures. 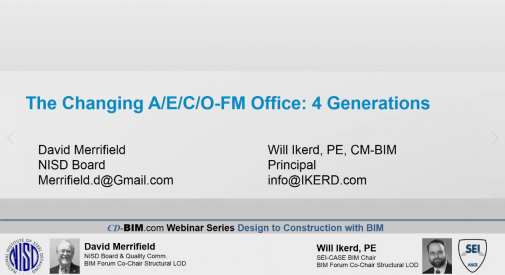 This video addresses how BIM and VDC are part of the changes taking place in the current A\E\C\FM office. It includes a generational perspective of how teams work together with these tools. It also discusses how the cloud is changing work in building design and construction. It presents tools such as the DISC assessment to address how different personality types come together in BIM on complex projects. Additionally, it shows how communication concepts from organizational development such as Transactional Analysis (TA) can be used to improve BIM meetings. Finally, it addresses how the new CD-BIM curriculum aids team addressing these challenges with it’s free online content. Tolerances are a critical concept in design and construction and a challenge in BIM where objects are normally represented in their theoretical final position. 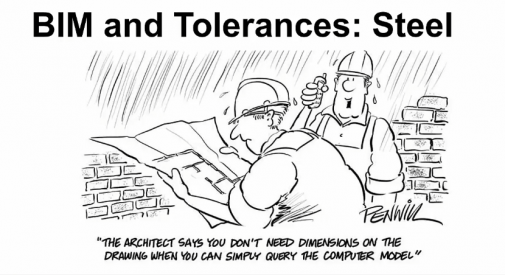 This video introduces the topic of tolerances with BIM, explores some common challenges, and discusses approaches to take on this fundamental topic. 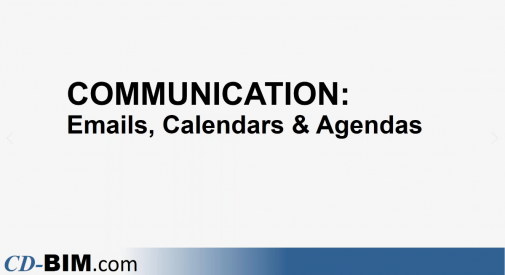 This video addresses effective communication concepts in BIM production and coordination projects. It also includes how BIM budgets are developed for production and coordination. Rules of thumb of how to budget model time and coordination schedules are reviewed. Level Of Development (LOD) discussion with NISD in conjunction with SEI-CASE BIM committee and BIM Forum leaders. 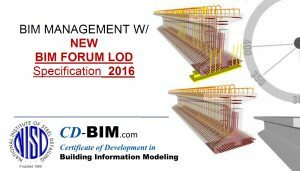 This presentation will provide an in-depth discussion of what is new in the 2016 BIM Forum LOD Specification. It will address BIM risk management with model elements at the different stages in a building life cycle: Design, Construction and Ownership. The framework of the discussion will consider the LOD Specification that defines models on a scale of 100, 200, 300, 350 and 400. This session has already passed. 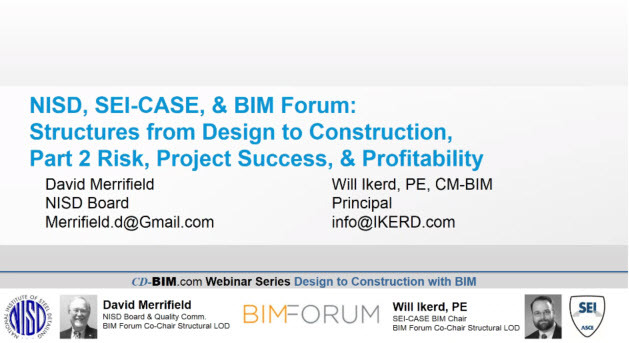 In this video, Dave Merrifield of NISD and Will Ikerd, PE, of SEI-BIM Committee present the first iteration in a series of sample models being developed by industry leaders with an initiative to demonstrate the implementation of the BIM Forum’s Level of Development (LOD) Specification in a practical medical office building sample model. This CD-BIM sample model is done in collaboration with NISD, SEI, and the BIM Forum’s LOD task-force. Viewers will learn how LOD is affected at each milestone through the LOD Sample Model. The current stages of the sample models show Schematic Design (SD), Design Development (DD), and Construction Document (CD) phases leading up to Issued for Construction (IFC) models.